I don’t know about you, but I’ve always been the kind of person who notices details. And what I’ve come to learn is this: glamour is in the details. Oh, and also this: glamour doesn’t need to cost an arm and a leg. In fact, you can often fake it — even for free! Not opulent, not gaudy. You don’t need mink-fur throws on the bed and a killer view of the city skyline to have glamour in your home. Although if those are your kind of thing, more power to you! (See my parting note at the end). Glamour, to me, is simplicity. Good quality, well-chosen pieces that you love (as well as well-loved pieces that you chose). It’s little details. 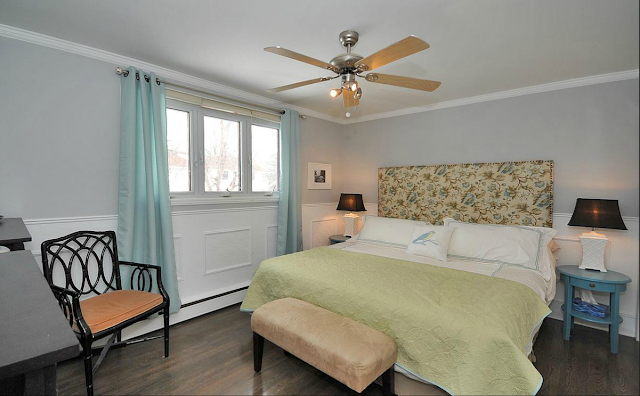 It’s a room layout that’s spacious and welcoming and well thought out. Glamour is a feeling. The secret is that less is more. With less stuff lying around the house (even less furniture), your place will immediately seem more spacious, brighter and more contemporary. What’s not glamorous about that? Remember, glamour is not about dollars. It’s an impression. Don’t be scared — in small doses, black is surprisingly palatable. And quite classy too! It’s like your room suddenly got ready to go out and put on a coat of rich mascara. Start small by trying it on lampshades (which you can spray-paint) or if you’re feeling bold, amp up the drama by painting your interior doors. More on that project shortly! Things seem like they’re well-planned when they’re perfectly symmetrical. It looks fancy! 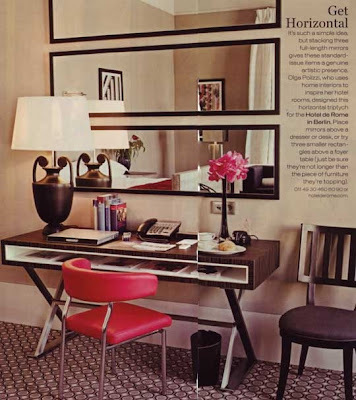 It doesn’t hurt that symmetry is pleasing to the eye and also feels well-balanced and calming. Try a pair of… anything. 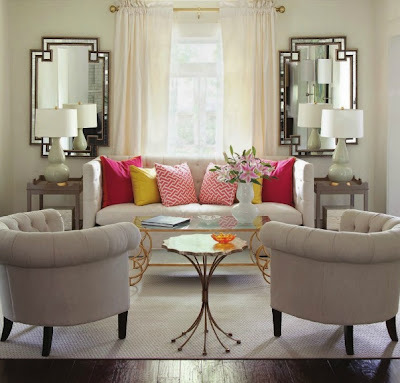 Above: pairs of mirrors, lamps, tables, chairs and couch cushions. Symmetry done right! Above: you can never go wrong with black & white! 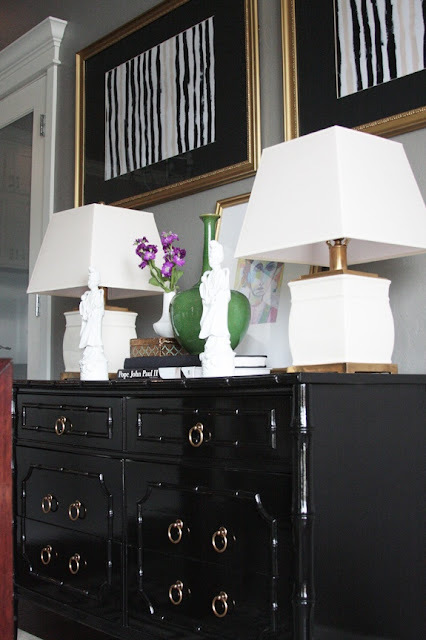 Ok first off, this black dresser is just gorgeous. So luxe in glossy black! (See #1). But then you’ve got the pairs of lamps, artwork on the walls, and white figurines. And as for the use of gold, read on. If you’ve got a broken coffee table, find a way to fix it or find it a new home. Same goes for broken lamps, frames, doorknobs, stained rugs, dirty throw pillows on the couch and cat-scratched chairs. You know what I’m talking about – the things you always apologize for when you have company over, or that just plain drive you nuts every time you see/use them. The things you surround yourself with and use every day don’t need to be expensive, but they should be clean and in good working order. Touches of gold = immediate glamour. I heart Elvis… but no! 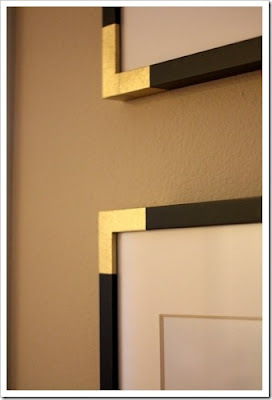 Try this trick to fancy-up your plain-jane frames: add gold corners! Click on the image for the tutorial. Spray-paint random objects matte gold and, if you so desire, turn them into a collection. Here are a few pretty things I’ve spray-painted gold m’self! Spray-paint a metal shelving unit for an airy and fancier display. Note: I love this Ikea etagere painted gold. So classy! 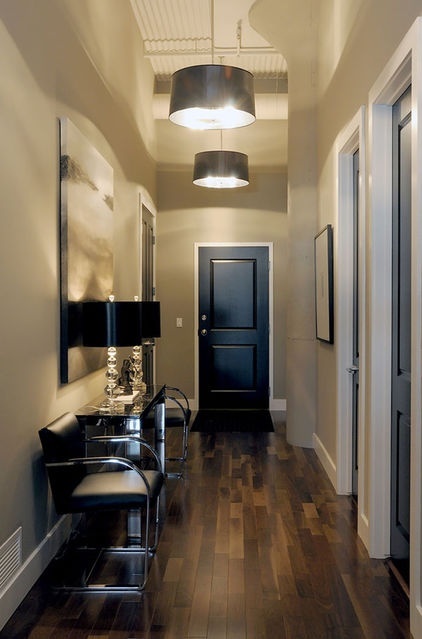 A nice entryway gives the impression of a big refresh of your entire home. Let’s not kid ourselves: first impressions always count. 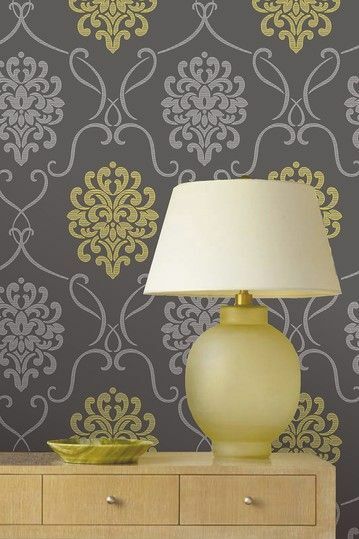 Try making a feature wall with wowie wallpaper (there’s even temporary, non-damaging wallpaper for renters – how cool!) or painting a bold colour. Or try this: inexpensive big-box store mirrors stacked horizontally. I just saw these recently for 7.99 each! This is so sophisticated, easy and modern-looking. Imagine a wall of mirrors like this when you walk in the front door. Wowie. Find a nice floor mat to catch dirt & debris from the outdoors. 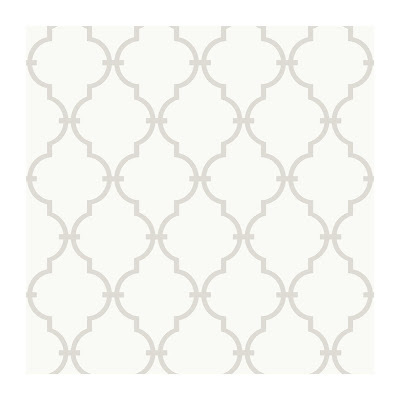 Graphic patterns hide dirt well! If you can’t quite put a finger on what bothers you about your place, instead of adding more things, try decorating in reverse by taking everything away. 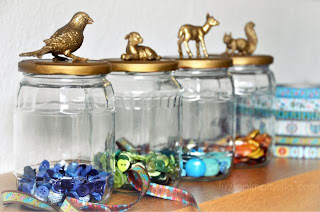 Take everything out of the room and only put back the pieces and objects that are necessary and/or you absolutely adore. Beauty may be in the eye of the beholder, but glamour is too. What’s truly glamorous is being surrounded only by things you love and make you feel good. BONUS #7: White flowers. Always white flowers. You can’t go wrong with a simple vase and some white flowers. Literally any kind with a bit of greenery and you’re good to go. I could go on and on, but I promised you ideas that are doable in 60 minutes or less. 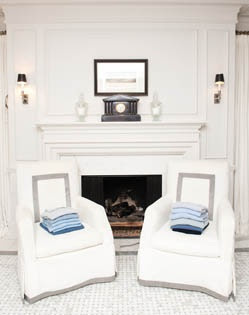 If you want a sophisticated-looking home, you’re gonna have to get a ‘cleanin. With a swift 1-hour decluttering session under your belt, you’ll already feel better about your place. I promise!! Have any simple & glamorous tricks you want to share? Please do in the comments below. We love hearing from you. Dare I go black for the hallway doors? Looks wonderful ! hmmmm….Might be a nice change…will let you know ! love the wall paper! saw a black-framed mirror @home goods that would look gorgeous with it! Hi Jackie! Yes! I'm loving black on doors. In our house we're doing black on the hallway side of the doors and white inside the rooms. Can't wait to hear more, and thank you for stopping by! Dare I go black for the hallway doors ? Looks fabulous ! Hmmm….might be a nice change…will let you know ! Thanks Julia! So nice to hear from you – I went to check out your blog and I love it! Am now following you on FB too! You're welcome to come on by and do the same. Talk soon!